As you know, the Picky Peaches love to try new restaurants. However, we can’t spend all our time eating. Sometimes, after a good meal, like we enjoyed at The Grey (see last week’s post), a nice walk is in order. 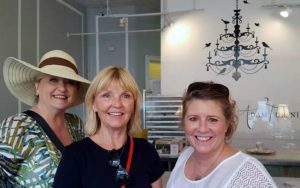 That’s why the 10th stop in Peaches on the Road is a stroll along Broughton Street to check out some of the shops. It’s a great place to spend a few hours on Saturday afternoon. To get there, all you have to do is turn left when exiting The Grey, then turn right on Broughton Street at the traffic light. 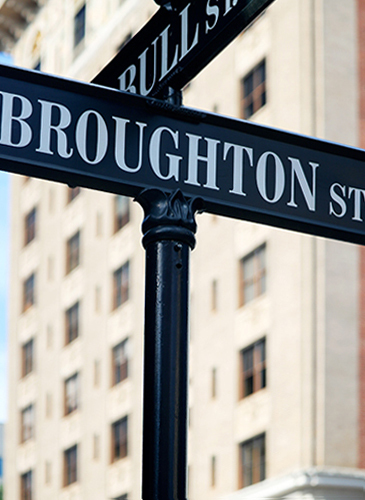 It’s so close that you can see the Broughton Street sign from the front door of The Grey. 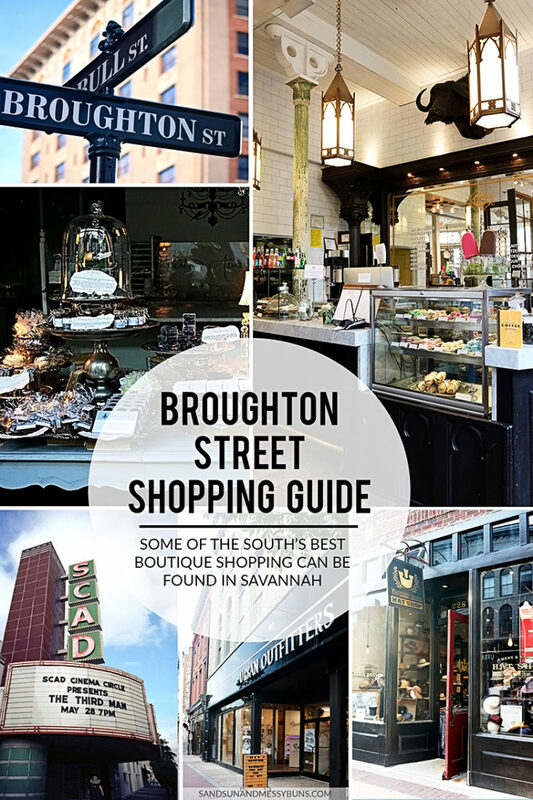 Broughton Street businesses run the gamut from national retailers such as J. Crew, H&M, Banana Republic, and Free People, to upscale boutiques, to thrift shops. A terrible thunderstorm was bearing down on Savannah when we were there. The rain and lightning were getting closer, so our time was limited. Instead of hitting the usual mall-type stores, we focused on those with more of a global-inspired, French accent. 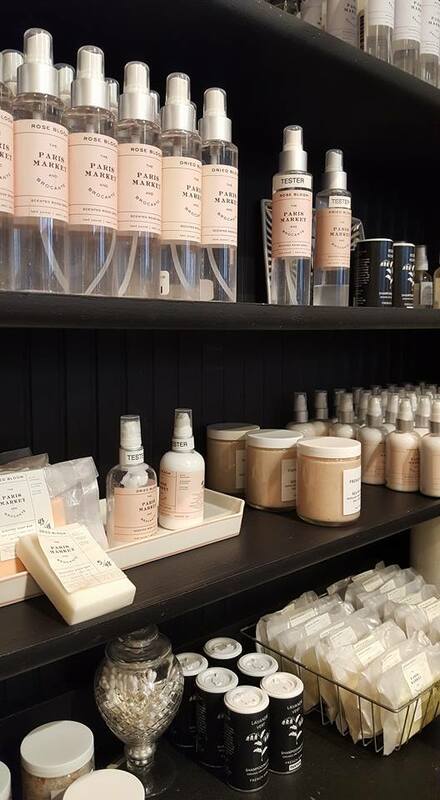 Broughton Street is truly a shopper’s paradise and we found some unique places that are certainly worth your time. Our first stop was the très chic Zia Boutique. 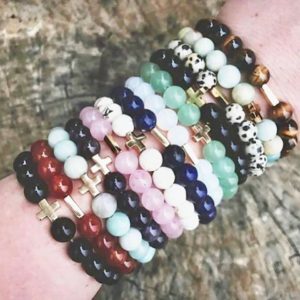 The selection of handmade jewelry, accessories and gifts from around the world is truly impressive. Zia was founded in 2005 by Zia Sachedina whose multicultural upbringing is evident in the collection. His mother is Japanese-American and his father is East Indian. Zia grew up in Kenya and the United States, so it’s not the same earrings and necklaces you see in many boutiques. 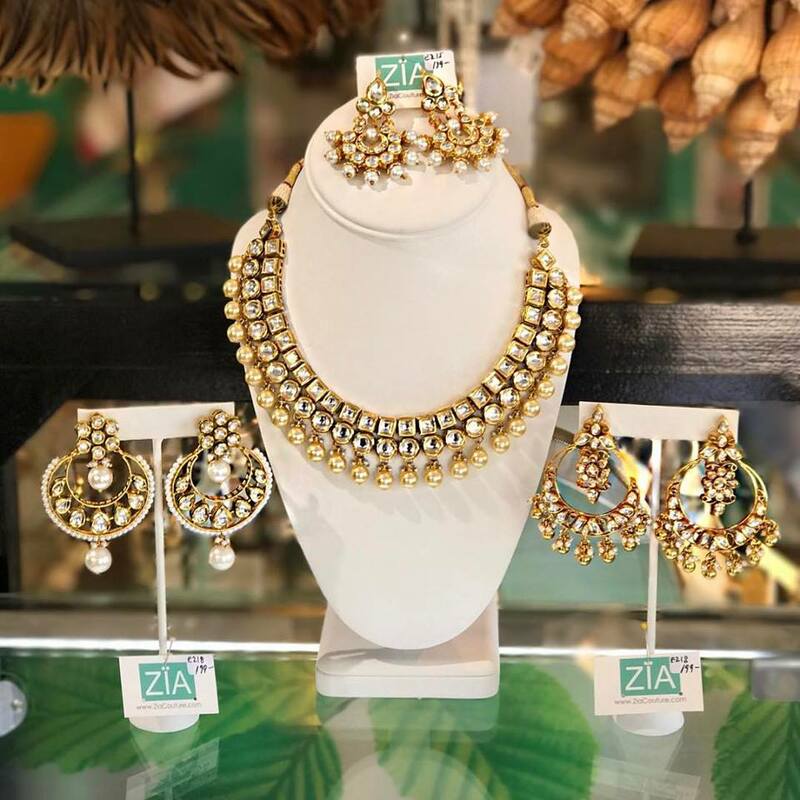 They have Liquid Metal, Modern Markasite, Sticks + Stones, Arabic Calligraphy, Tribal Chic, Uno de 50, statement pieces, Zia’s own Couture Collection and much more. Unfamiliar with these brands? See? We said it’s unique. Zia Boutique, 325 W. Broughton Street, Savannah, GA. Hours: Monday – Saturday 10:30 a.m. – 6:00 p.m.; Sunday 12:00 p.m. – 5:00 p.m.
Chocolat by Adam Turoni is so much more than a candy store. The Dining Room-themed decor is part formal dining room and part Alice In Wonderland fantasy. 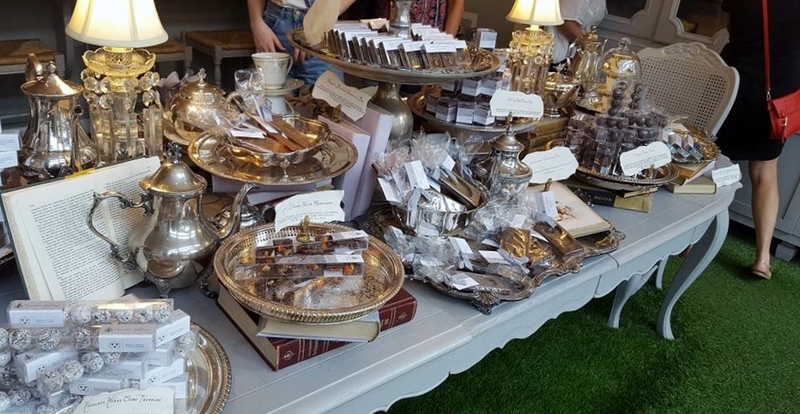 With its AstroTurf floor and silver display pieces, the decor is absolutely stunning and the quality of the chocolate is superb. We want to be perfectly clear: there are no lollipops, jawbreakers, taffy or anything else associated with those confections in this shop. This is hostess gift and marriage proposal chocolate. The assorted handmade truffles and bars are tiny works of art, and they’re fittingly displayed in very creative and elegant ways. This chocolate is actually worth the calories. 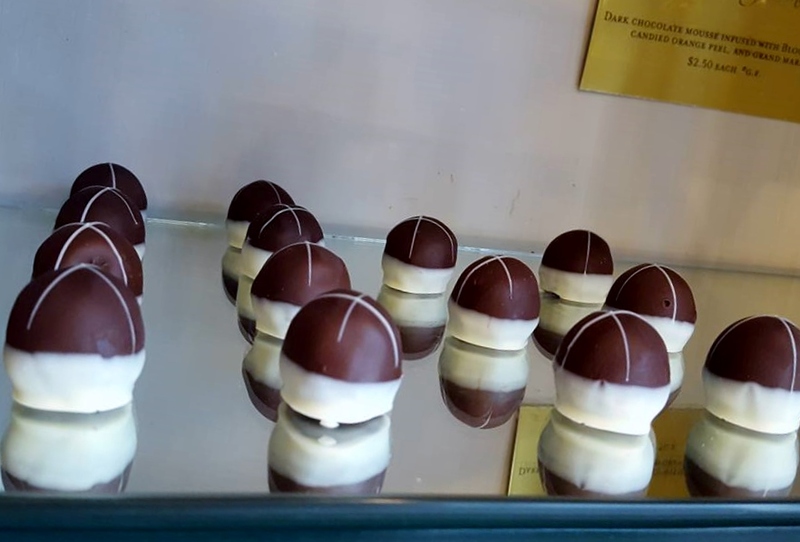 Chocolat by Adam Turoni, 323 W. Broughton Street, Savannah, GA.
Maybe you’re more of a macaron connoisseur. 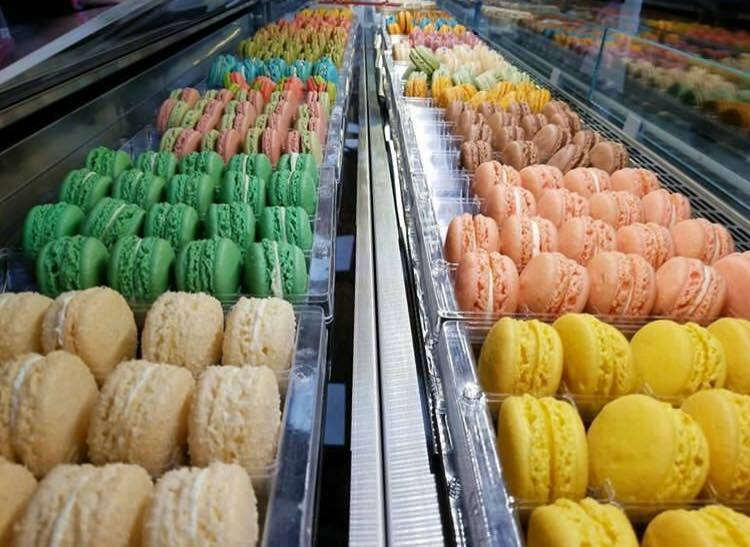 If so, we encourage you to slow down and savor one of life’s little luxuries at the incredible Le Macaron. Created from ground almonds and soft meringue, French macarons should not be confused with the more familiar American coconut cookie. Right off the bat, you’ll notice the rather large selection of these light-as-air delicacies. We can tell you that they taste as good as they look. Sometimes macarons are a bit bland, but these have lots of flavor. These are handmade with the utmost care and quality ingredients. They are lightly crisp on the outside and creamy in the center. Choose from traditional flavors such as chocolate, vanilla or lemon. 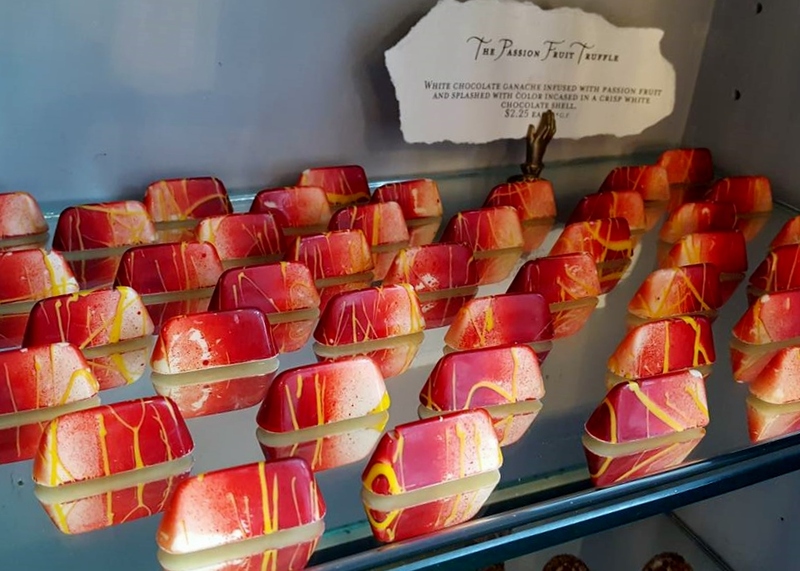 If you want something a little different, seasonal flavors may include salted caramel, strawberry key lime, passion fruit dark chocolate, Sicilian pistachio and more. As a bonus, they’re gluten-free and only about 80 calories each. C’est magnifique! 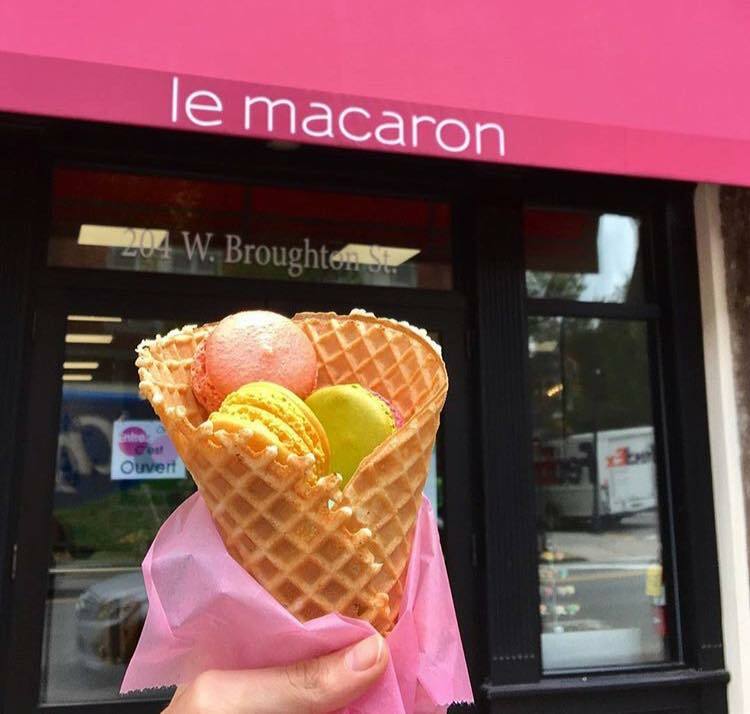 Le Macaron, 204 W. Broughton Street, Savannah, GA. Hours: Monday – Wednesday 9 a.m. – 8 p.m.; Thursday- Saturday 9 a.m. – 10 p.m.; Sunday 10 a.m. – 6 p.m.
Make your way further down the street to the Paris Market & Brocante and say bonjour to a wonderful shopping experience. Opened in 2001, it’s clear that they’re doing lots of things right. 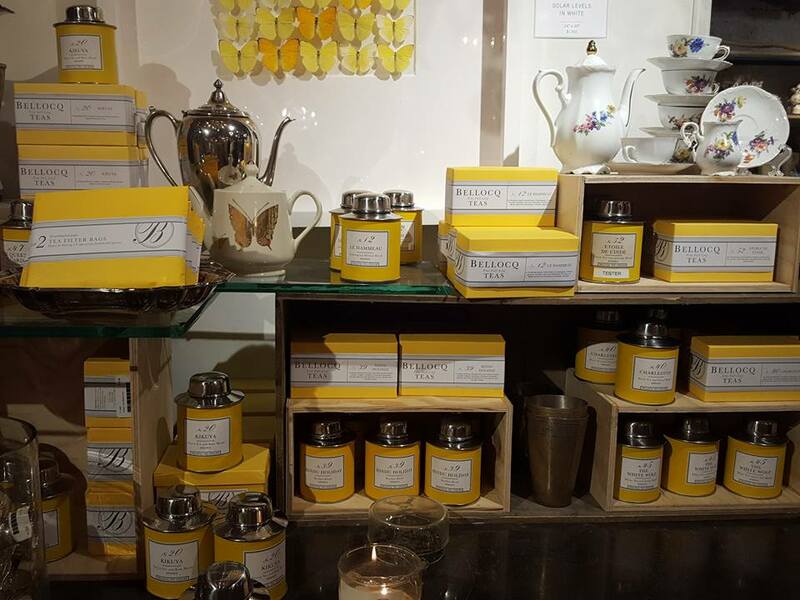 The main level of the store is filled with lovely gifts for friends, family and yourself. From leather goods, to trendy jewelry to scented sprays and soaps, everything is fine quality. That level of quality extends to the children’s section with its beautiful selection of baby gifts and children’s toys. Just when you think you’ve seen everything, head downstairs for even more eye candy. 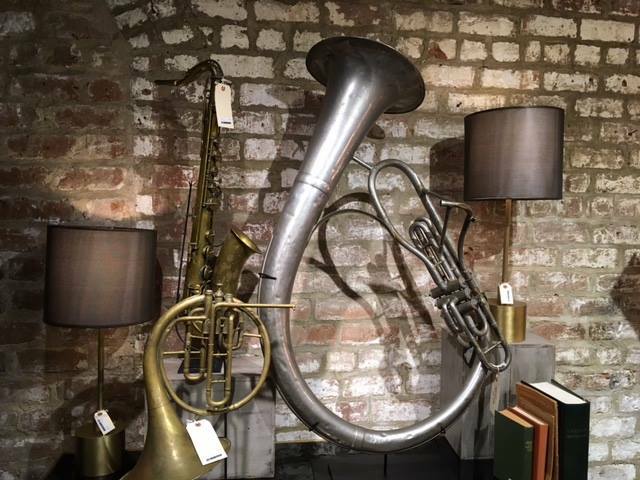 The vintage home decor, new furnishings, and accessories are displayed more like an ever-changing museum installation than ordinary stores. It’s just beautiful! We were also enthralled by the gifts for the connoisseur section. There are loose teas, cheese boards, aprons, julep cups, small-batch cookies, as well as essentials for the well-stocked bar. 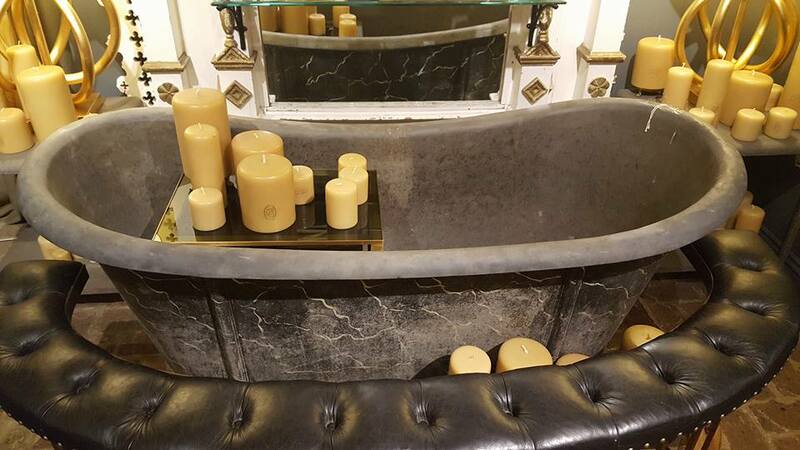 The Paris Market is such a beautifully-curated boutique that you don’t want to miss it. 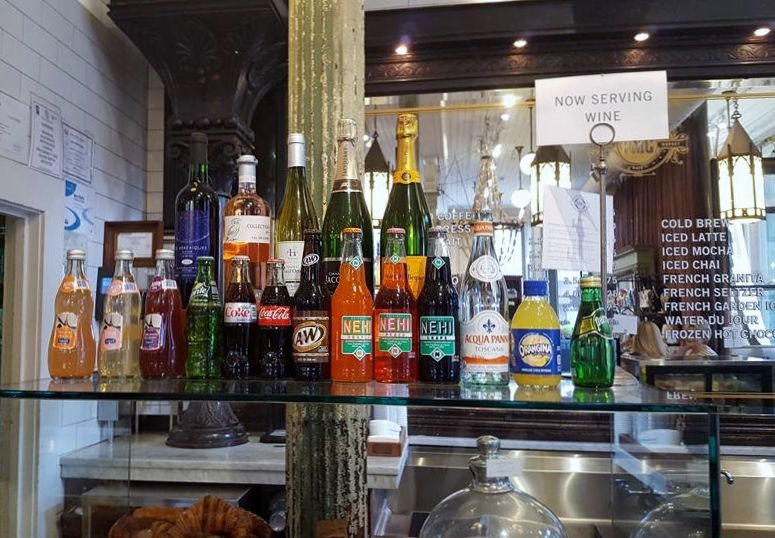 If all that shopping has you dragging, stop in the Paris Market Cafe. It’s the perfect place to take a break with a classic latte or a glass of champagne. After all, it’s a French Market. The Paris Market & Brocante, 36 W. Broughton Street, Savannah, GA. 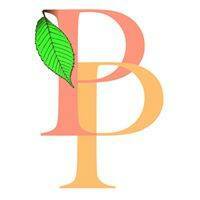 Hours: Monday – Saturday 10 a.m. – 6 p.m.; Sunday 11 a.m. – 5 p.m.
Saturday late afternoon. Either keep shopping, wander around the Historic District, or head back to the hotel for a little break before dinner. Join us next week for the 10th stop in the Hidden Gem Restaurant Challenge. We promise that the Caribbean-inspired flavors will tickle your taste buds. ← PICKY PEACHES ON THE ROAD #9: Leave the Driving to Us! The Grey in Savannah, Ga.